Our tale continues! …and the Christmas Bat hasn’t even made an appearance yet. Funny, this story was conceived as something short and sweet, a little tale meant to help dip my toe back into writing and drawing JEFbot while I continued working on getting a “real job.” Since that time, it has grown exponentially, and what started as a 1-2 pager has now become a thing that will have to be told in no less than 8 installments. I was thinking I could get this out before the end of 2014, then pushed it ’til the end of January, and now (due to getting more freelance work this month than I had assumed, which is a good thing) I’ll be lucky to have this saga complete before March. Ah, well – The Bat doesn’t abide tradition as you know, and it seems he wants to keep Christmas going for a couple more months, so who am I to disagree? Enjoy! 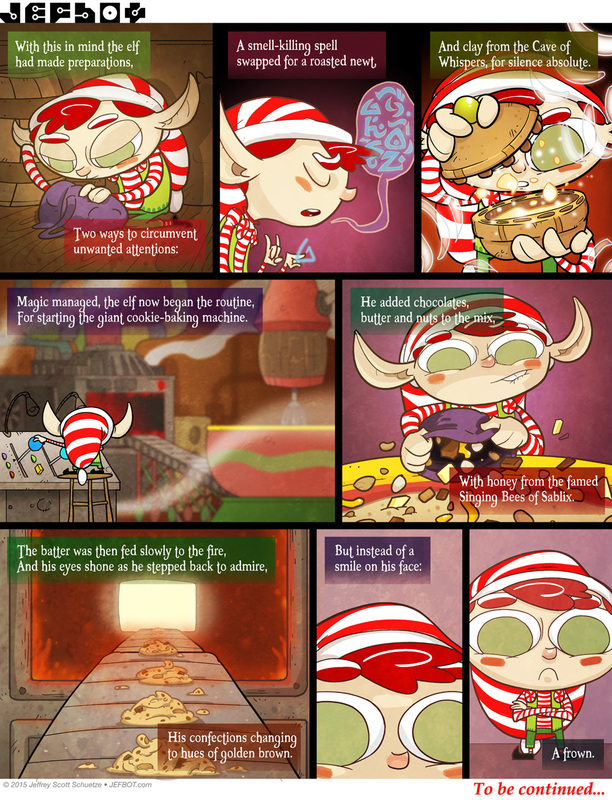 indeed, F_f – we’ll find out the reason for the Peppermint Elf’s frowny face in the next strip! That also goes for you but, gotta keep your elfin hands busy, happy to hear work is picking up! thanks! yeah, it’s not work i wanna be doing as a career, but it’s paying (some of) the bills right now, so i’m happy for it! Is there a shades of seconding? Do I want to know why he’s frowning? Yeah, guess I do. Bring on part IV! yep, you’ll find out about that frown next time, GB! Poor Little Elf indeed! Glad you are picking up rent money! Continue to do freelance it all adds up. yes! making rent is good! hopefully i’ll pick up some more jobs (or one awesome job) soon, Kris. so far, that’s the plan, DJ! i have a booth reserved but it’ll all depend on the job sitch. i’ll keep ya updated. His full name is Christmas to Chinese New Year or Maybe St. Patrick’s Day Bat, but he goes by Christmas Bat for the sake of brevity. I’m really liking the rhymes. It really gives off the mystical/magical feeling of it all. Still waiting for the regular ‘bot update. The flame_fingers cameo ain’t done yet! As great as seeing the Christmas Bat (or at least tales in the Christmas Bat universe) has been, I too am eagerly awaiting a return to the mainline ‘botverse. Heck, I’ve been patiently waiting almost two years for the H.A.M.S.T.E.R. spinoff comic (“Homosexual Alien-Manipulated Strike Team for Extraterrestrial Response” for long). Man, H.A.M.S.T.E.R. already sounds amazing. Marvin started it, Jefbot encouraged it, and I came up with the acronym. ‘bot promised the spinoff would come the following week. Oh my… I saw my insensitive comment again. It’s two years old and I still feel guilty. Gay people are just other people to me now. Oh dear…would you believe I’m so self-involved I didn’t even realize there was commentrovercy all up in those old threads? i think it’s awesome you allow yourself to evolve on issues, ROM! feel good about that. you got it, dralou! spoken like a true chef. seems the elf’s spells backfired a bit. we’ll soon see what he does about it. Oh, what a nice surprise! I know I missed the first couple of updates, but coming back randomly and seeing an update really is super cool. Thanks for the gift, and keep on truckin’! We’ll be here when things even out! glad you’re back, Rebecca, and i’m happy you were surprised! i’ll definitely be truckin’ on (even if the updates are a bit sporadic) from here on out. Jell I am so happy the comic is back. I am a long time reader and I was afraid the comic was gone for good. I wish you luck on the job search and welcome back! Ahhhhhhh.. Freelance. Welcome to Schedule C, ‘Bot. But it does have it’s perks, doing graphic and web design form home, commute is only 45 seconds! Bedroom to desk! Carry on. Good to see the toons back! heheh. yep, that’s the nice thing about freelance, SamuraiArtGuy, except for the jobs where i have to drive out to santa clarita at 5:30am, which takes about an hour, but i’m grateful for the work! and happy to see you back here, man!